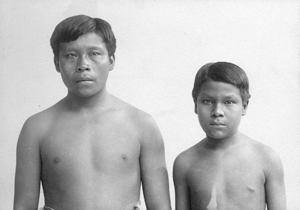 December 16, 2010 /Photography News/ A Leicester University researcher has discovered photographic images of two native Amazonians who were brought to Britain in 1911 as part of efforts to highlight human rights abuses. 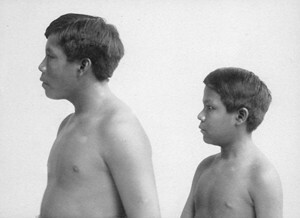 Dr Lesley Wylie, a lecturer in Latin American Studies at the University of Leicester, who made the discovery during her research for a book on the Putumayo, a border region in the Amazon, believes the images are those of a man and a boy -- Omarino and Ricudo -- shipped to London by Irish revolutionary Roger Casement, who was hanged for treason in 1916. The two were shipped from their homeland in a bid to show officials how the boom in rubber production had affected tribesmen. The images depict the subjects naked to the waist against a pale background, in half-length front and profile shots, in accordance with the genre of anthropological photography of the time, and have been published as part of a research paper on Casement. Casement made trips to the Amazon in 1910 and again in 1911 on behalf of the British government to investigate alleged atrocities against the indigenous population by a rubber company. Omarino had been ‘presented’ to Casement for payment of a pair trousers and a shirt while Ricudo, a married man of 19, had been separated from his wife after Casement ‘won him’ in a game of cards. Dr Wylie said that, despite the fact that today these ethnographic photographs strike us as somewhat dehumanising, Casement’s decision to commission them would not have been out of the ordinary in 1911; rather, it was consistent with the racial ideology of the time. This in itself is of interest to researchers, since Casement has so often been regarded as resistant to this colonial mindset. Dr Wylie, who has published the photographs in the Irish Studies Review, said: 'The photographs essentially reduce the subjects to racial "types" - the man and boy are no longer regarded as individuals but as physical specimens supposedly embodying certain racial characteristics. 'I came across the two photographs among a photographic collection held by the University of Cambridge's Museum of Archaeology and Anthropology. 'Although the catalogue card identified the sitters simply as "Two slaves from Putomayo (sic) river, Up. Amazon, Colombia", I suspected immediately that they were the two Amazonians that Casement had brought to London in 1911. 'I had previously seen a copy of William Rothenstein's painting of the subjects, and there was a strong resemblance between it and the photographs.